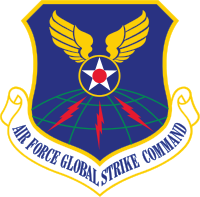 Air Force Global Strike Command is the direct descendant unit of the Cold War-era Strategic Air Command. It holds the lineage, history and honors of SAC. AFGSC consists of approximately 23,000 professionals assigned to six wings, two geographically-separated squadrons and one detachment in the continental United States and deployed to locations around the globe. Eighth Air Force is designated as U.S. Strategic Command's Task Force 204, providing on-alert, combat-ready forces to the president. The mission of "The Mighty Eighth" is to safeguard America's interests through strategic deterrence and global combat power. Eighth Air Force controls long-range nuclear-capable bomber assets throughout the United States and overseas locations. Its flexible, conventional and nuclear deterrence mission provides the capability to deploy forces and engage enemy threats from home station or forward positioned, anywhere, any time. The 8th Air Force motto is "Deterrence through strength, global strike on demand." The Missouri Air National Guard 131st Bomb Wing is a traditional associate unit of the 509th Bomb Wing at Whiteman AFB, flying the B-2 Spirit. If federalized, it is gained by Eighth Air Force. The B-2 Spirit is a long-range nuclear and conventional stealthy bomber. The bomber can fly at high subsonic speeds at altitudes that can reach 50,000 feet. Its unrefueled range is at least 6,000 nautical miles. The B-2 brings massive firepower, in a short time, anywhere on the globe through the most challenging defenses. The B-52 Stratofortress is a long-range, nuclear and conventional heavy bomber that can perform a variety of missions. The bomber can fly at high subsonic speeds at altitudes reaching 50,000 feet. It has an unrefueled combat range in excess of 8,800 miles. It can carry precision-guided ordnance with worldwide precision navigation. Twentieth Air Force is responsible for maintaining and operating the Air Force's ICBM force. Designated as STRATCOM's Task Force 214, 20th Air Force provides on-alert, combat-ready ICBMs to the president. The ICBMs are on 24-hour/365-day alert and are ready to launch on any given day. Twentieth Air Force's ICBM team plays a critical role in maintaining global stability and ensuring the Nation's safety and security. 450 Minuteman III missiles provide a critical component of America's on-alert strategic forces. As the Nation's "silent sentinels," ICBMs, and the people who operate them, have remained on continuous, around-the-clock alert since 1959. AFGSC's 20th Air Force is the Air Force's lead command for and largest operator of UH-1N Huey helicopters. The UH-1N supports ICBM operations in missile fields controlled by F.E. Warren AFB, Malmstrom AFB and Minot AFB. Secretary of the United States Air Force Michael Donley discusses the creation of the Global Strike Command with media representatives at the Pentagon on 24 October 2008. Following the 2007 United States Air Force nuclear weapons incident and the 2008 incident in which four MK-12 forward-section reentry vehicle assemblies were mistakenly shipped to Taiwan, former Secretary of Defense James R. Schlesinger led an investigation into the status of U.S. Air Force nuclear surety. Secretary Schlesinger's recommendation was the creation of a single command under which all Air Force nuclear assets should be placed for better accountability. On 24 October 2008, the Secretary of the United States Air Force, Michael Donley, announced the creation of the Air Force Global Strike Command (AFGSC) as a new Air Force major command (MAJCOM). Along with Air Force Space Command (AFSPC) at Peterson AFB, Colorado, AFGSC is one of two Air Force component commands reporting to United States Strategic Command (USSTRATCOM) at Offutt AFB, Nebraska. The new command began operations in August 2009, combining the nuclear-capable strategic bomber force previously operated by Air Combat Command (ACC) and the land-based intercontinental ballistic missile (ICBM) force previously operated by Air Force Space Command (AFSPC). The USAF currently has 20 B-2 Spirit and 57 B-52 Stratofortress bombers and three missile wings of Minuteman III ICBMs that are designated as nuclear-capable. When needed for conventional missions, the B-2 and B-52 bombers will be reassigned to regional commands. Although formerly assigned a nuclear mission, the B-1 Lancer bomber force transitioned to a strictly conventional mission force and was retained in Air Combat Command. In November 2008, the USAF announced plans to start a fourth B-52 squadron at Minot Air Force Base to support Air Force Global Strike Command, The USAF added that, "all the nuclear-capable bombers of what is now Eighth Air Force, and [command of all ICBMs] of what is now in Twentieth Air Force, will report to this single new command.". This action was accomplished on 3 September 2009, when the 69th Bomb Squadron (69 BS) reactivated at Minot Air Force Base. In April 2009, the preliminary team selected Barksdale AFB as the headquarters for the new command. Donley stated that the factors which contributed to the selection of Barksdale over the other candidate bases were its connection to the 8th Air Force, a "slightly larger [air] operations center", and the base's hosting of the 11th Bomb Squadron (11 BS), which trains B-52 aircrews and will be adding special emphasis on nuclear training. On 18 June, after an environmental assessment finding of 'No Significant Impact', Barksdale Air Force Base was announced as the permanent location for AFGSC. On 7 August 2009, the command officially became active with Lt Gen Klotz assuming command of the organization. The headquarters staff includes 900 people, and reached full operational capability by 30 September 2010. The Twentieth Air Force (20 AF), the service’s missile organization, came under the new command on 1 December 2009, and the Eighth Air Force (8 AF), the bomber component, came under the command on 1 February 2010. United States Air Force, 26 September 1947 – 1 June 1992; 7 August 2009 – present. ↑ "AIR FORCE GLOBAL STRIKE COMMAND (USAF)". Air Force Historical Research Agency. 17 July 2009. http://www.afhra.af.mil/factsheets/factsheet.asp?id=15047. Retrieved 17 January 2012. ↑ This story was written by Tech. Sgt. Lee Osberry Jr.. "69th Bomb Squadron reactivates at Minot AFB". Minot.af.mil. http://www.minot.af.mil/news/story.asp?id=123166325. Retrieved 2012-10-09. Wikimedia Commons has media related to Global Strike Command.